Neuritic plaques (bundles of beta-amyloid protein) and neurofibrillary tangles are key signs of Alzheimer’s disease. 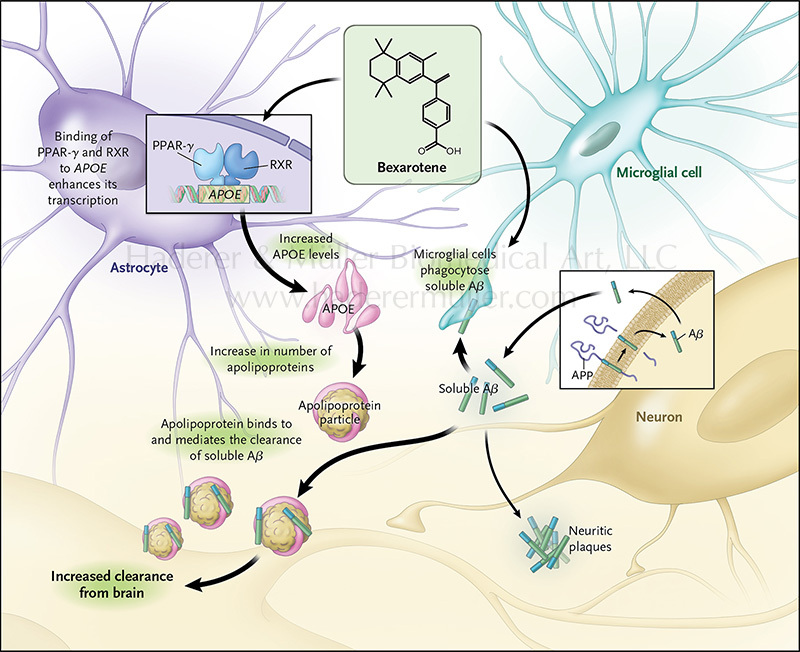 A major risk factor in non-early-onset Alzheimer’s disease is a defect in the gene for apolopoprotein E (APOE), a cholesterol transport protein which contribute to the breakdown of beta-amyloid in neuritic plaques. Individuals with the APOE4 allele (common in Alzheimer’s pateints) of the APOE gene have an increased risk for the disease as compared with individuals with other alleles. The drug bexarotene (Targretin) shows promises of efficacy in preclinical models by improving the degenerative phenotype by way of boosting apoE levels, thereby reducing the level of plaque in the brain.